No journey would be possible if it wasn’t for our fleet. These vehicles have travelled the length and breadth of the country, they’ve seen everything from conquering the Himalayas in the Monastery Escape, to spending cold starlit nights on the Jaisalmer dunes in the Royal Escape. 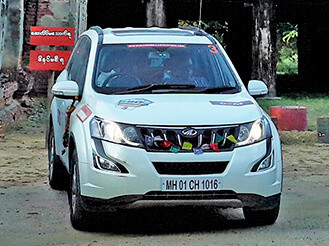 They’ve brought nations together in the India Myanmar Thailand rally and hushed their way through to Russia. Needless to say, our vehicles have a lot of stories to tell. 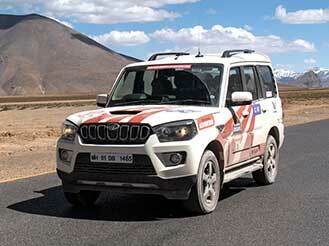 The Mahindra Adventure fleet comprises of various Mahindra 4WDs. But it is the Mahindra Scorpio that forms the backbone of our fleet. When you arrive to drive, it is the Mahindra Scorpio that becomes your home for the next few days. The easiest way to recognize Mahindra Adventure vehicles is by the characteristic orange stripes of the Mahindra logo on the sides. And if you see one with headlights on, watch out because the expedition convoy is on the way. The Mahindra Thar combines the legendary off-road ability of the MM540 with the modern drivetrain of the Mahindra Scorpio. They form the backbone of the Great Escape fleet for their obvious superior off-road capability. You will also find them in the front and back of the expedition convoy ensuring your safety and providing some vital automotive eye candy throughout the expedition. They’ve been customized appropriately for the kind of rough use they go through. We promise when you look at our Thar, you’ll want one. 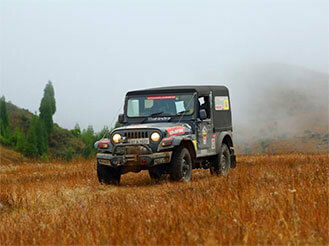 We also have specially prepared Mahindra Thar that you can drive at the Mahindra Adventure Off-Road Training Academy. The Scorpio forms the backbone of our fleet and these are the ones you pilot on our expeditions. All our Scorpios are top-end S10/S11 trim and come with electric shift-on-the-fly 4WD transfer cases. They can take a beating and then some. With over 70 units in our fleet, the vehicles have to be rugged to survive what we put them through. And the Scorpios don’t disappoint year after year. We pride ourselves in maintaining these in top spec so they’re ready to go whenever you are. They’re so rugged, they’re lovable. The Getaways are responsible you get to your destination on time and in one piece. They’ll make their appearance on expedition as service cars and house the support crew and supplies. They also provide support during the IRC and other motorsport events carrying supplies for the SuperXUV5OOs. With their substantial load carrying capacity, the Getaway makes for the perfect companion on a long arduous journey to the Himalayas. Did we mention all our Getaways are 4WD? They’ll walk the talk if they have to. So don’t mess with them. The cheetahs as we lovingly call them are used for official duties during the expeditions. All our XUV500s are top-of-the-line W11 AWD. 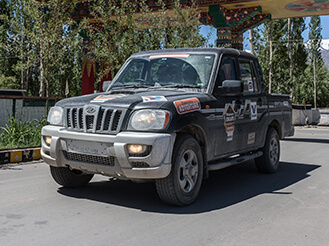 We knock them about not only during the expeditions but also follow the rally routes during the Indian National Rally Championship (IRC) and other raid-rally events. 155bhp worth of mHawk ensures we get there almost as quickly as our rally cars. You’ll hardly ever see them unless you open a newspaper and see their exploits in rallies around the country. The current INRC champion has been running rings around lighter, petrol-powered competition ever since it hit the scene. It may slightly resemble the domesticated XUV500 that you’ll see during the expedition, but underneath these special cheetahs have lots of goodies. 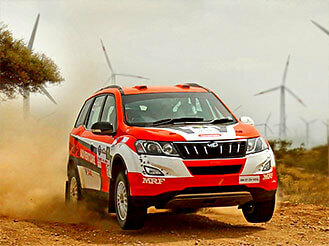 If you ever see a blur of orange and silver on a rally stage, it’s probably a SuperXUV500 on its way to the podium. These mean machines are piloted by the best in the business – Gaurav Gill/ Musa Sheriff and Amittrajit Ghosh & Ashwin Naik combination. 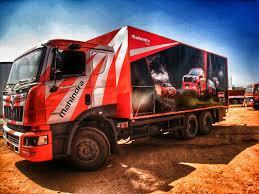 At Mahindra Adventure, we have a penchant for big machines. So it isn’t surprising when there’s a fight at the office over the keys of the biggest addition to our fleet – the Mahindra Navistar Truxo 25. The Truxo 25 with its payload capacity of 16,000kgs, has enough and more place for all our rally equipment, spares, crew and rally cars. The Truxo 25 can be sighted at service parks during the rally stages or at the Great Escapes.